Favori - Flevo Berry B.V.
Favori is an everbearing variety with excellent characteristics. The quality and yield of Favori are very good. Favori is a fast grower, meaning that the variety comes into production early. The fruit are conical and elongated in shape and have the Elsanta colour, which, just as the shine, is also preserved during storage. 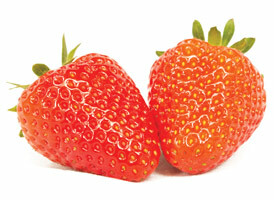 Favori is Flevo Berry’s primary variety in the everbearing flavour segment and is an improvement on Mara des Bois. Because of its aroma, Favori is very suitable for direct sale, but it can also be easily distributed through other sales channels. Favori requires good cultivation conditions from the soil and the temperature. The soil structure must be open and should not contain any wet spots. Favori can be cultivated in outdoor fields and also on raised beds. Favori grows vigorously in substrates, so the plant density should not be too high. It is important to strike a good balance between the growth of the leaves and the fruit. The plant type and the time of planting have great influence on the harvesting period. Autumn planting with plug plants can lead to a harvest peak in the spring. Frigo plants (March/April) come into production later and their peak occurs in July/August. Early planting can be viable, but the ground temperature must be at least 7-8 °C. The outside temperature must be at least 10- 12 °C; in lower temperatures it will be necessary to use fleece. In substrate we recommend 5-8 plants per metre. Favori is an open plant. During hot periods, Favori has not much problems with fruit malformation. The harvest period begins early in July and continues without any problems in August and September. The flower trusses tower up above the plant, making it easy for the fairly rainfast fruit to be picked. Favori develops new flower trusses quite easily and therefore remains well in balance. The colour of the fruit is the same as that of Elsanta and does not deepen much more after harvesting. The flavour is very good, pleasantly well-balanced with a light aroma; you can’t stop eating Favori!